Australia face some "large hurdles" in getting over the ball-tampering scandal which "shocked and hurt" a nation but "it will be business as usual once the heat gets turned up", says Adam Gilchrist. The Baggy Greens return to international action for the first time since the controversy against South Africa in March when they start a five-match one-day series against England at The Oval on Wednesday, looking to rebuild their battered reputation. Captain Steve Smith and batsman David Warner were banned for 12 months and Cameron Bancroft for nine months after they carried out a plan to ball tamper against the Proteas, while coach Darren Lehmann left his post after the 2-1 defeat in the fiery Test series. Justin Langer has replaced Lehmann and Paine has taken over from Smith as skipper. Former wicketkeeper-batsman Gilchrist, who will be working for Test Match Special during the series against England, believes Langer's appointment "is very appropriate to try to take these challenging steps ahead". "The England series is the first step on a journey that everyone seems to be acknowledging will take some time to rebuild complete trust and faith in everything that has gone on," he told BBC Sport. "There is no doubt that the players that were held responsible for what took place not being there allows the team to start that journey. "This team will face some large hurdles over the course of the next 12 months, not just in rebuilding trust and confidence with the public supporting them, but in regards to missing a significant amount of first pick players. "That is going to present an awful lot of challenges." What will Langer do to change things? Gilchrist took the game to new levels with his destructive batting style and was part of three Ashes series wins and three World Cup victories during a 12-year career that started in 1996. He played with former Australia opener and "dear friend" Langer, in a team which included the likes of Shane Warne and Glenn McGrath, who were notorious for sledging opponents. And, while he admits the team in his era was "not perfect", he says "if it bordered on getting over the top" then the captain, senior players or team-mates would step in and "hopefully, we were able to rein it in and then just get back to playing the best cricket possible". However, he believes the team's desire to win in South Africa got the better of them. "If they were in any situation where it looked like they weren't going to win they became so desperate to back up the manner with which they were playing that they became almost too desperate to win," he said. "That may be incorrect, it is just an observation. "What I found on our journey and where we were well mentored by a guy like John Buchannan as coach and our leaders was that - it's a bit cliche - but if the focus is purely on winning that is taking your eye off it a little bit. "It will be back to the old well-worn cliche that it's about process - that's what's important, the process not the outcome. That's what I remember from the successful period that I was lucky to be a part of. "I don't want to accuse the previous leadership group of not doing that because I don't know, but what I am happy to predict is that Justin will rely on good old fashioned well-worn out phrases and values that provide consistent behaviours." Will Australia be missing an edge after the South Africa fall-out? Smith, Warner and Bancroft were sent home from South Africa after the third of four Tests following the ball-tampering in Cape Town and the fall-out included the trio later apologising for their actions. Cricket Australia also set up a panel, which includes Paine, to consider a new "behavioural charter" for the men's team as it also conducts an overarching independent review into governance issues within the organisation and Australian cricket. Paine says the team will reduce their levels of sledging under his leadership, although they "won't be silent" having spoken about "the difference between abuse and banter". "I remember being reprimanded for behaviour," said Gilchrist. "I was charged a number of times by match referees for certain verbals or showing disappointment or discontent. "You get told about it and pulled into line and, a few times, we sat back and thought 'do we need to tone it down?' and often we said 'yeah, we do - we've just let it slip a little bit'. "It never felt like we needed to or we ever considered saying or doing nothing. There is just a natural instinctive part of sport that makes it so wonderful and what we all love and there is certainly room for it in cricket so long as it is well monitored." He added: "I think it will be business as usual once the heat gets turned up. "It might be a little bit subdued early but there will be a competitive point where things will be said back and forwards. It's happened forever and it will continue to happen in competitive sport." And Gilchrist expects "there will be some pretty hostile crowds having a good bit of fun with the Aussies around what's happened" during the one-day series. Langer, who played 105 Tests for Australia, scoring 7,696 runs, before retiring from international cricket in 2007, was appointed in May on a four-year deal. 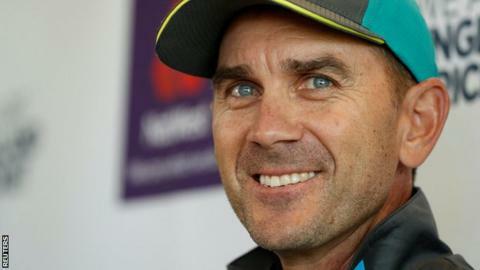 He took over having led Perth Scorchers to three Big Bash Twenty20 titles and Western Australia to two domestic 50-over crowns. Glichrist added: "Justin is a beautiful human being. He is just such a considerate, warm and caring person who is continuing to learn on his own journey and become a more considered person both professionally and personally. "One of his greatest strengths is that he has a basic philosophy of just being a good person and a lot of other things will fall into place. "These young guys will benefit a great deal, not just in a cricket sense but a life sense from having Justin as a mentor to them." How much are Australia weakened by absentees? In addition to Smith and Warner not being available, pace bowlers Mitchell Starc and Pat Cummins are also absent with injury from an Australian squad with several new names for the England series. Batsman D'Arcy Short, who has five T20 appearances for Australia, has been named in the ODI squad for the first time. "Smith and Warner have been the scorers of the lion's share of runs in most formats in recent years so it is a significant hole," said Gilchrist. "But I feel there are a number of players that can really step in and be productive and do a really good job. "It's going to be challenging, particularly in those conditions against a highly-ranked and highly-rated England squad. "There could be matches when they are bowled out really quickly because they are so attacking, but it's going to take a little bit of trial and error as well as a show of faith and trust from selectors. "It's going to be an aggressive looking line-up and should it come off it will look great."